It's The World's Best Veggie Burger from Local Burger in Lawrence, Kansas. I've known about these for quite a long time but it was only last week that I finally had one. I'm kicking myself for not having one sooner. 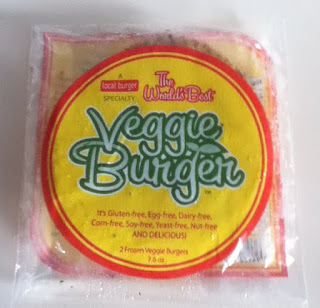 If you toast it or cook it in a skillet with a little oil, their veggie burger gets a really nice crust and has a great crunch when you bite into it. Of the 3 I've eaten so far, I've eaten them plain. I like them on their own. I'm not compensated for my opinions on things like this. I just thought it's worth writing about so people can read about the types of things I eat that has helped me lose over 100 pounds.